The long awaited Kalbarri trip is just around the corner: Friday 29 May to Monday 1 June 2015. Steep sandstone walls carved out by the Murchison River provide both trad and sport climbing opportunities. Roughly six and half hour’s drive north of Perth, this unique climbing venue is well worth the trip. 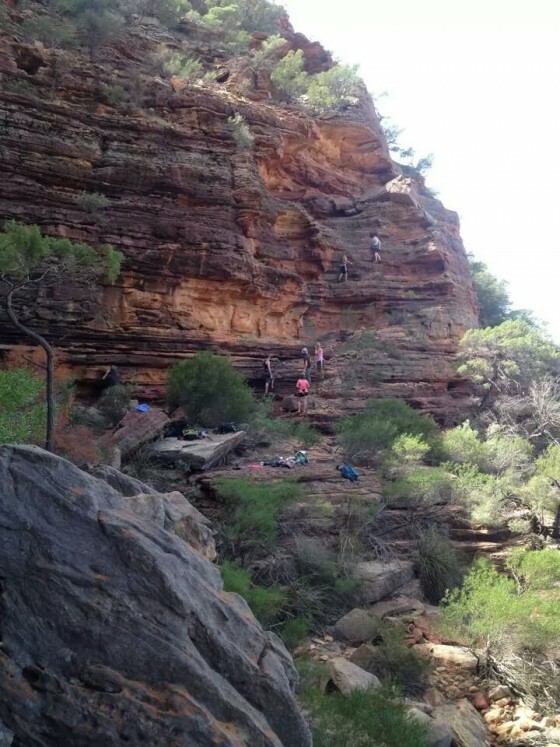 Kalbarri provides opportunities for trad leading in the middle and upper grades and sport climbing at a high level. You couldn’t ask for a more picturesque setting. If you haven’t been before, the gorges are truly spectacular and just a great spot to spend the day. Winter is prime time climbing in the gorges, with excellent friction. Don’t be deceived by the weather forecast: it can be very cold in the gorge and those that had down jackets were very thankful last year. It’s unlikely this time of year for flies to be a pest, but remember to pack your fly nets and repellents. Though the areas around the Z Bend tend to attract most climbers, there are some great trad routes and the ability to set up top topes using the abseil access path. There is some excellent, moderate trad climbing out at Hawke’s Head. Be aware that this great little spot requires the ability to abseil in and climb out. We would love to see you all there. We also need to make sure that everyone is clear about what to expect of the area. Kalbarri is not an ideal venue for beginners, unless they are accompanied by a suitably experienced climber. This is because access to routes will usually require lead climbing and the ability to set up top ropes is very limited. The climbing also tends to be moderate to very hard. For those of you planning to set up top ropes, you will need at least a twenty metre static rope due to anchor points being fairly far apart. The main guides to the area are Northern Rock and West Australian Rock. These will give you a good idea of the climbing on offer. The road out to the Z Bend is now sealed for the first twelve kilometres. The remaining section can be in variable condition but accessible by 2WD. We have some luxurious, unpowered, grassy tent sites booked. Please let me know as soon as possible if you plan to attend so that we can ensure we have enough space to accommodate everybody. These days caravan parks require deposits, so we only book a few sites until we have numbers confirmed. Whilst limited camping is allowed in the gorge, Department of Parks and Wildlife (DPaW) would much prefer that climbers refrained from doing this over long weekends, especially the June one. CAWA would ask that in the interests of preserving our positive relationship with DPaW that everybody seriously consider staying in town. The sealed road makes road closure far less likely in the event of rain. There is particular sensitivity because one group of climbers left a lot more than footprints last year. Please register by emailing me at garys@climberswa.asn.au. I will then send you a questionnaire to complete and provide further details. I will do my best to assist members to organise car pooling. Please note that CAWA trips are only open to current members. Not a member but keen to come along? Join online via this link: Become a CAWA member. Please also read the CAWA trips page for important information. CAWA is not able to provide training due to liability issues and so all climbers on the trip must be independent participants who are completely responsible for themselves. Any inexperienced climbers or participants under the age of 18 must have a parent, guardian or other responsible person to accompany them. If you are an inexperienced climber then have a chat to some of the more experienced people you know and see if they are planning to attend.